For over 10 years the playgroup operated from Kingshurst Youth and Community Centre, however, re-development plans for the area meant that a new base for the playgroup was needed. In 2017, the playgroup moved to newly refurbished premises located next to Kingshurst Primary School, School Close. In February 2017, the playgroup became a Community Interest Company with advice and guidance from the Community Enterprise for Success, a business programme supported by Solihull Council and the Greater Birmingham and Solihull Local Enterprise Partnership and is part-financed by the European Regional Development Fund. “It was a great help to have an expert in these matters to advise us on most appropriate governance structure for our group and then support us with the registration process. Being a CIC will help strengthen our financial footing and ability to provide free pre-school provision to low income families in the area,” added Elaine. More good news came in August as Children in Need awarded Kingshurst Caterpillars a grant of £50,000 over three years to provide supported play sessions to two to four year-olds. 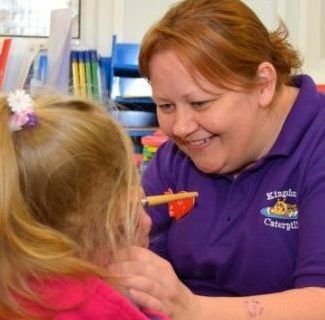 Kingshurst Caterpillars Playgroup is open weekdays and can be found on School Close, Birmingham, B37 6BN. For more information call 07947 661067. Facilities include a large playroom, entrance hall, outdoor play area, toilets and storage facilities.